Q: How to change the page background color of the flash flip paper? Some of you may run into this: while you are browsing a flip book online, when flip to a page that is still loading, the page will show white or some other color before content load succeed. But some of them are disasters of your eyes. It is a significant detail you have to pay attention if you want to make sure that your flash magazine to be highly appraised. 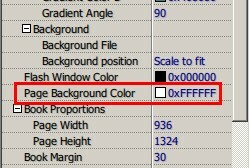 To change the page background color, you just need to find “Page Background Color” option, and customize the value.